An eerie silence and tense atmosphere had forced her to retreat indoors following violent protests over a 150% fuel price hike that had rocked the landlocked nation some hours before on Monday last week. On the ground, a veneer of peace existed after the police and the army had quelled protests following chaotic scenes of looting of shops, burning of cars, tyres and road blockades by the rioters. But come dusk, she never imagined she could be a victim of the army retribution in such a callous manner. “A group of soldiers in masks destroyed the precast wall at our family house at around 1am. Armed with AK47 assault guns with bayonets, switches and sjamboks, they barked orders saying there were some protestors hiding in the house. But it was just me and my one-and-half years-old kid in the house. I kept quiet, and they started shaking the doors, breaking windows and my kid was frightened and started crying. “They forced open the main door, and ransacked the whole house. They were visibly high. When they got into my room, they started clapping and kicking me, asking why i was quiet and did not open the door for them. Then they demanded to see the protestors whom they said were hiding in the house, but i told them i do not know anything about the demonstration,” she said. “I never imagined i would be raped by the soldiers, whom we had marched side by side in the streets in a putsch to oust former president Robert Mugabe in November 2017. The boring thing is that i had stayed indoors the whole day and never participated in the protests,” she said, tears flowing uncontrollably at the Counseling Services Unit (CSU), a local health institution that offered free medical treatment and counseling to the victims of the military crackdown last week. Even the counselor consoling her could not stop her from wailing. The trauma was written all over her face, and she was terribly shaken by the sexual assault. “How would my husband, based in South Africa, react to this? He will divorce me,” she said. She is among two women raped by soldiers in Harare, according to the CSU. The other one is a 17 year-old girl. “From Tuesday to Sunday last week, we treated 105 victims, including six juveniles aged between 11 to 17, as well as senior citizens. Most of those we treated here had soft tissue injuries, from assault from baton sticks, chains; some had lacerations on feet, and buttocks. Among the victims were two females sexually assaulted including a 17 year old,” a counselor at the institution said, on condition of anonymity for fear of army reprisals. He added that there were other 50 critical cases which they did not treat but referred them to the Zimbabwe Doctors for Human Rights. Among the 50, some had gunshot wounds, he said. “We offer medical, psychological, and counseling services here since some were assaulted in front of their kids, so we counsel the whole family,” he added. 12 people died in the week of the stay-away, dubbed #Shutdown Zimbabwe, which was called by the main labour body, the Zimbabwe Congress of Trade Unions (ZCTU), as well as social movement, #ThisFlag. ZCTU president Peter Mutasa, and #ThisFlag leader, pastor Evan Mawarire were also not spared in the arrests. They are facing charges of subversion, treason and inciting violence. According to the Zimbabwe Human Rights NGO Forum, 12 people died, while 78 had gunshot wounds. 242 had dog bites and were tortured or assaulted, while 466 were arrested. The organization recorded 466 cases of wanton destruction of property. “The Forum has received disturbing reports of armed security personnel breaking into private homes of citizens, indiscriminately torturing occupants including children as young as 9 years old. Through our membership, we have recorded at least 844 human rights violations during the shutdown,” the organisation said in daily updates and in its report. Even the government’s human rights body, the Zimbabwe Human Rights Commission (ZHRC) conceded that citizens were ‘systematically tortured’ during the week of the stay-away, insisting police officers used live ammunition, instead of rubber bullets. 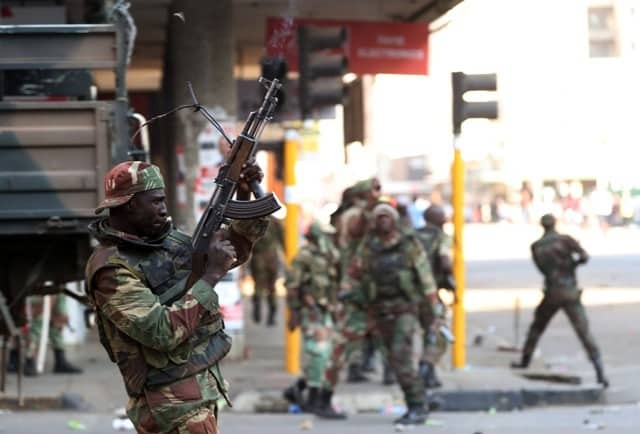 “At least eight deaths have been reported to the commission and mostly attributed to use of live ammunition,” Sheila Matindike of the ZHRC said at a media briefing in the capital, Harare. “They seem to resort to use of brute, excessive and disproportionate force in most circumstances thereby causing avoidable loss of life and also worsening the situation…raising questions about their crowd control capacity,” she said. However, both the army and the police said those involved in killing civilians were not genuine security agents but deserters, retirees and imposters who had stolen army uniforms. On Saturday night, Police spokesperson Commissioner Charity Charamba together with her Zimbabwe Defence Forces counterpart, Colonel Overson Mugwisi, at a press conference, shifted the blame to fake soldiers and police forces in stolen fatigues during an earlier protest. The army and police refused to take questions from journalists during the presser. However, a senior army officer, Lieutenant Morrosi Carnage of Inkomo Mounted Regiment, a police officer, Ignatius Zuze and several ZANU PF youth leaders were arrested for taking a leading role in the bloody riots, arson and looting of shops in Epworth, a ragtag settlement south of Harare. Government spokesperson, George Charamba, in what appears to contradict the army and police explanations during the course of the stay-away, ominously warned that worse things were to come for the protestors. “The response so far is just a foretaste of things to come,” he said, from Azerbaijan, where he had accompanied Mnangagwa. Observers said the army and police were trying to hide behind a finger and their excuse exposed them further for failing to account for their uniforms, guns, vehicles and helicopters which could not have been stolen, which will also erode their public trust and capability to defend the country in foreign attacks. “The claim that there are non-security people committing atrocities while clad in police and military garb is very unconvincing and even if true, speaks of failure by the security sector to, not only run their institution, but also look after their tools of trade,” said Jealousy Mawarire, spokesperson of the opposition National Patriotic Front party. “Surely, we can’t have an army or police force failing to account for their uniforms, weapons and officers, whether retired, dead or resurrected. The real issue is that there are divisions in the army, police and the state along the faulty lines within a disintegrating Zanu PF. The centre is no longer holding and another coup is loading,” he added. During the week-long stay-away, the government shut down the internet, a move which critiques said the Mnangagwa administration wanted to mask the human rights abuses. The internet and social media sites were restored Monday following a High Court challenge of the ban by the Zimbabwe Lawyers for Human Rights (ZLHR) and regional media lobby group, the Media Institute of Southern Africa (MISA). Charamba, had earlier on justified the internet shutdown, saying the net was, “the tool used to coordinate the violence; in other words it was part and parcel of the accessory of tools put in place to ensure that there was maximum damage on our society and naturally when you are reacting to a conspiracy of that nature…you ensure that society is protected”. President Mnangagwa, who was on a tour of Europe, was forced to cancel his Davos trip to deal with the turmoil back home to ‘to get Zimbabwe calm, stable and working again,’ he said on his official Twitter page. What followed was regrettable and tragic. Everyone has the right to protest, but this was not a peaceful protest. Wanton violence and cynical destruction; looting police stations, stealing guns and uniforms; incitement and threats of violence. This is not the Zimbabwean want,” he said on Twitter. He also called for dialogue to fix the country’s comatose economy. “I invite leaders of all political parties as well as religious and civil leaders to set aside our differences and come together. What unites us is stronger than what could ever divide us. Let’s begin a national dialogue. Let’s put the economy first. Let’s put the people first,” he said. Mnangagwa threw the rogue soldiers under the bus, promising that heads will roll in the security sector. “Likewise, violence or misconduct by our security forces is unacceptable and a betrayal of the new Zimbabwe. Chaos and insubordination will not be tolerated. Misconduct will be investigated. If required, heads will roll,” he said. However, his sincerity is yet to be seen as he did not punish the same soldiers when they killed protestors on August 1 last year in a bid to force the electoral management body, the Zimbabwe Electoral Commission (ZEC) to release presidential results early. Six people were shot at close range by the soldiers in the capital, Harare. The August 1 shooting resulted in Mnangagwa setting up a commission of inquiry chaired by former South African president, Kgalema Motlanthe. But recommendations from the commission are yet to be implemented. Neither did the soldiers that shot the six civilians brought to book, even though some were positively identified in news and social media footage.